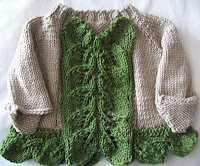 Now just two little leaves to sew onto the fold back cuffs of the sleeve, and the sweater is done. Well there is still the hat—but that will be quick! And there is the small snaps to buy and sew on-That will be done tonight. Well the sewing tonight—I will have to run out today and buy the snaps! I especially like how the double leaf pattern distorts the knitting in just the right way—make a shaped front to the neck—the end—with the full leaves are not part of the pattern—but work out perfectly. A perfect little organic growing thing! I think I will put off starting Crazy Eights till tomorrow—After the Sunday knitting group—so far there will be maybe 5 or 6 knitter—small. But it will grow. It's hard to start a group—But a good meeting place is must. One group I started to attend? Every week, a new place.. and none of them were well suited. They were too small or too inconvenient—A good meeting place needs to be near public transport & to have good (or at least some) parking. Better yet if it is an easy to find place (the Rego Park mall has red roof.. that can be seen from outer space!) And Panera's offer good food—not to expensive—and not junky (fries, greasy burgers) but salads and lean sandwiches. OK, they have cookies and pastries, too. But. If you are in Kew Gardens, or Middle Villiage, or Elmhurts, or any near by neighborhood.. come on by! I look forward to seeing you tomorror at 2PM. That sweater is going to be adorable. I hope the parents will let you share a picture of it in action!